Here is a summary of what the book is about. In a perfect world, sixteen -year-old Phoebe Martins life would be a book. Preferably one filled with magic and a hot paranormal love interest. Unfortunately, her life probably wouldn't even qualify for a quiet contemporary. Everything changes when Phoebe learns that Dev, the hottest guy in the clarinet section, might actually have a crush on her. So, Phoebe turns to the heroines in her favorite books for inspiration, but becoming as awesome as her book characters isn't as easy as it sounds. When another girl nets Dev for herself right out from under Phoebe's nose, she's crushed. And, to up the suckage, she gets assigned as his co-counselor at a sixth grade camp and has to spend an entire week tied to the hip with the one guy on the planet she wanted to avoid. Can she make it through the potential danger of romantic bonfires and nature walks, or will her counseling career end in emotional disaster? 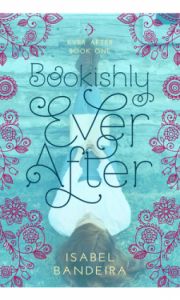 Can she ever go back to her happy world of fictional boys after falling for the real thing? I felt this was a well written story. It is a page turner. They say boys in books are just better. I have to disagree having a real relationship is always better even though they can sometimes get messy. I absolutely loved this book. I totally could relate to Phoebe because I am also a book nerd. I am looking forward to reading more books by this author.